Five of these were taken with a mobile phone, five with the fuji x100, and two with the Canon 40D. Two are double exposures (a technique I started playing around with this year), one is a composite, and one was with the lensbaby. 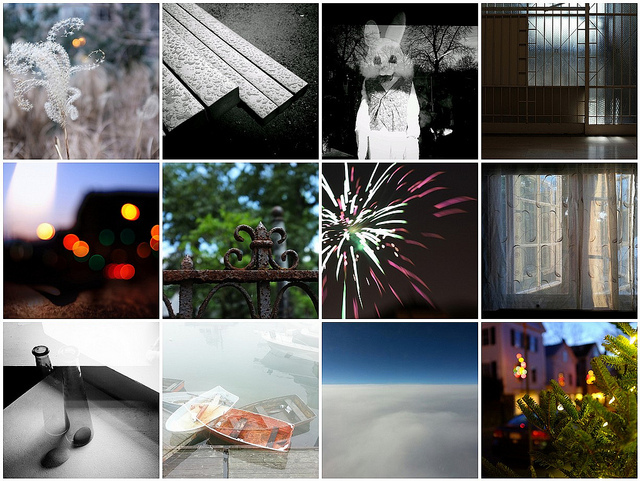 When I first saw this year’s grid my thought was that it was a quiet year, photographically speaking. Not that I didn’t shoot a lot (though less than last year, since I wasn’t doing a 365 project) but that I seemed to be finding, or looking for, some quiet in my photos. Not a bad thing to be searching for, certainly.